My goal for this system was to build something that would help me learn during track days, schools, and races. I wanted something that would show the track ahead, my hands on the wheel, and my feet during shifting. I achieved this with two cameras- one in the rear of the cockpit facing forward, and one under the dash facing the pedals. 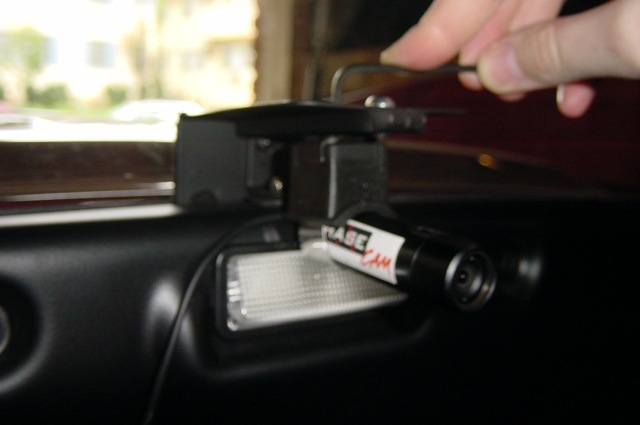 For cameras, I started with a Chase Cam for the footwell, as these are excellent in low light situations. For the main camera, I went with a Sony CC-5R SuperHAD bullet camera. It handles the extreme contrast difference of the interior and exterior of the car very well. Most cameras will set their auto-iris based on the light level in the cockpit, which will cause the view out the windshield to be very over-exposed. Both these cameras run on 12V, which is very handy. For recorders however, things were more complicated. Various companies have solutions ranging from $300 up into the thousands. All I wanted was a compact MPEG recorder that would do 640×480 @ 30fps, with no moving parts, and would run on 12V. I needed either two recorders (one for each camera feed), or a box to join the two signals with a picture-in-picture effect. I found what I needed with the Neuros company. Their Recorder2 is cheap, and meets all my requirements It seems to be intended for converting video to run on the Sony PSP, but it’ll do what I want also. Buying two recorders was considerably cheaper than buying one and a mixer box. This has the added benefit of generating two unmodified data sources. In my experience, it’s better to gather audio and video as unmolested as possible, and do all effects and mixing in post production. This leaves one small problem- synchronization. The two recording streams need to be started at the same moment, or matching up the tracks in post-production will be difficult. The solution turned out to be very simple- the Recorder2 has a remote control, so if the units are placed close together, pressing Record on one remote will start both units at very close to the same moment. Okay, there’s one other slight problem- the Recorder2 runs on 5V, not 12V. That was solved with a switching power supply that will also give the electronics a quiet, friendly power source (of which cars usually have neither). Here’s some sample video shot with this system at a track day. This is compressed for YouTube. The native quality of the recordings is quite a bit better, and a full-resolution (33MB) sample can be downloaded here. For more samples, head over to my YouTube channel. All race video you see there was shot with this system over the course of a few years of training, practicing, and time-trials. Here’s the final product. Note that when we’re done, we’ll have a handy place to mount a V1 radar detector. 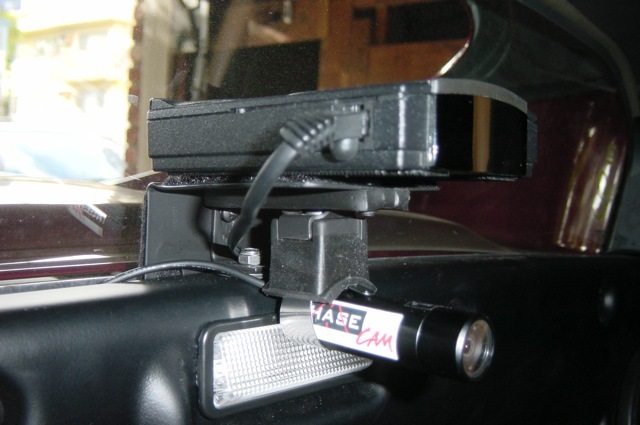 Shown here is a ChaseCam. I later switched to the previously mentioned Sony SuperHAD due to auto-iris issues with the ChaseCam in this position. Here’s a rough schematic of what we’re building. 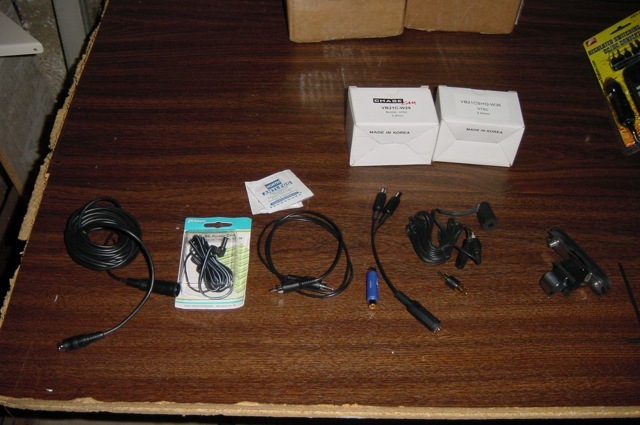 Here are the bits that come with the Chase Cam. We’ll use several of these parts for the Sony camera as well. 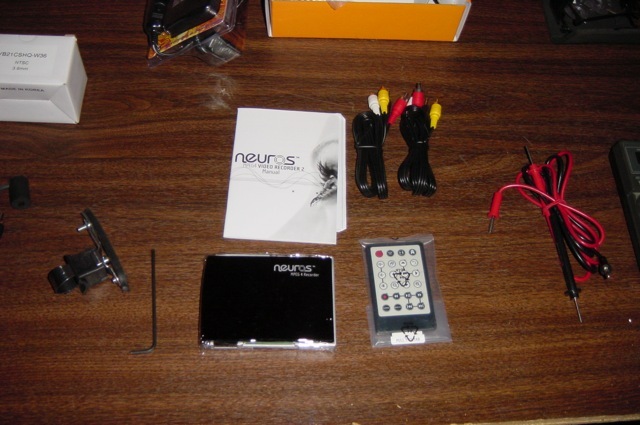 This is one of the Neuros Recorder2 kits. The first step is to build the camera mounting assembly. 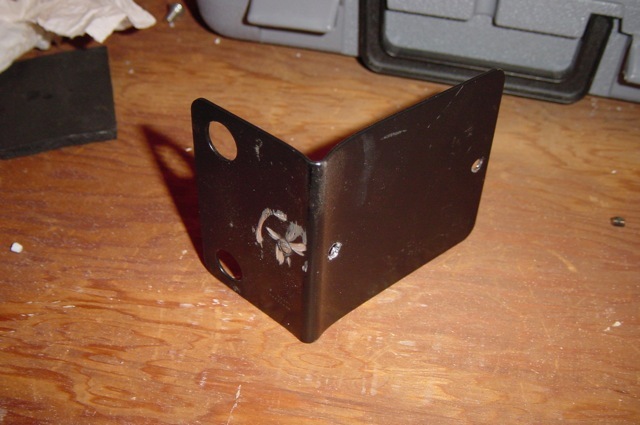 This is based on a Radio Shack Radar Detector Mounting Bracket. Straighten the bracket to 90 degrees and remove the suction cups. Next, we'll be using some assorted hardware as shown here (YMMV). Using a Dremel rotary tool, slot-out one of the holes in the L-bracket. You want to get the hole as close to the end of the bracket as possible, while still leaving enough material to hold securely. 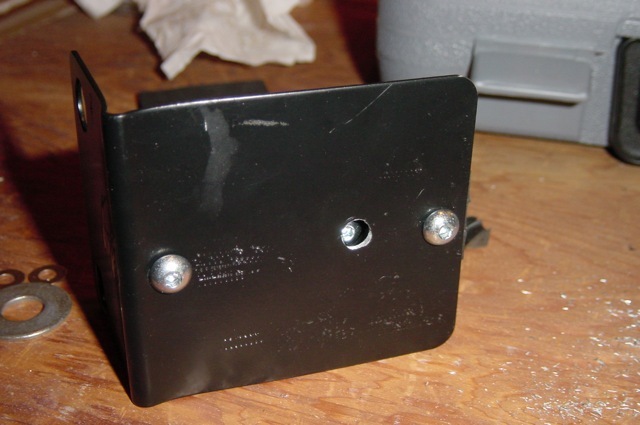 Use a short machine screw to fasten the bracket to the Radio Shack plate via the small suction cup mounting threads. Use thread-locker on this screw, and allow it to cure for 24 hours before continuing. The bottom edge of the blue tape in the above photo marks where the top surface of the bulkhead is. As you can see, the L-bracket is slightly too short, even with the hole slotted out. That's why it's important to get the slot as long as possible. A large washer will be used to fill the remaining gap. 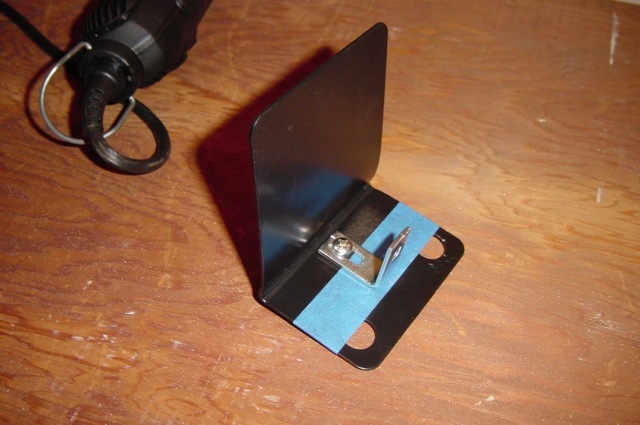 Next, use the Chase Cam cradle as a template to mark and drill two holes in the top of the plate. It's important here to get the holes as close to the long end of the plate as possible, while still leaving enough material to hold the screws. At this time, you should also drill a larger access hole in the plate for the adjustment screw on the cradle. 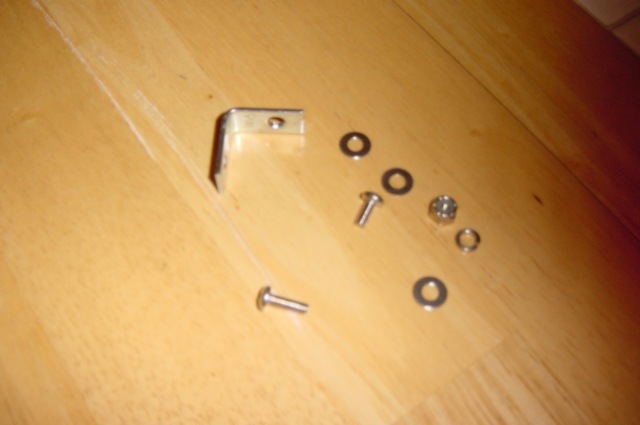 Use a Dremel to cut off the excess length of the short screw holding the L-bracket. 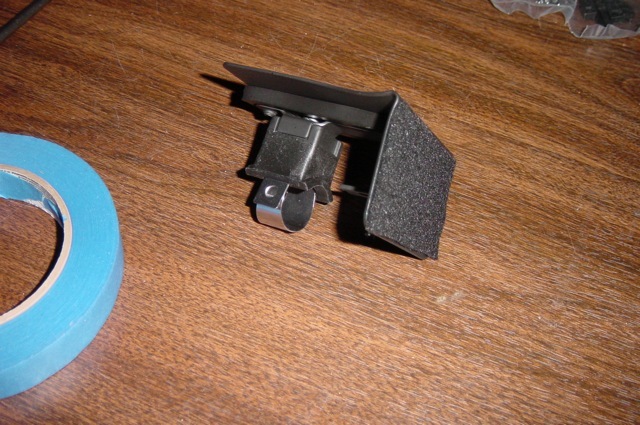 Mount the camera cradle to the underside of the plate, with the rubber bushing in between. Trim the bushing to length. You may need to grind the end of the camera cradle bracket down to clear the L-bracket screw. The top of the assembled unit looks like this. Note the access hole for the cradle adjustment screw. This is important! Here's the underside of the assembled unit. 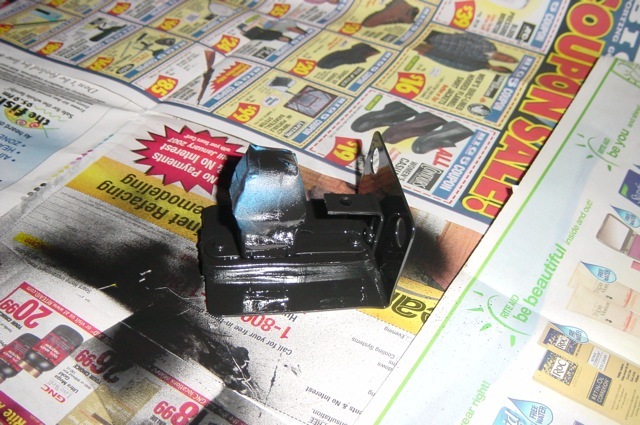 Next, mask off the cradle's band clamp, and paint the whole thing black. You should also paint a large washer at this time. Once dry, cut a piece of black felt to match the back side of the short end of the plate. Affix it with double-stick tape. This protects the rear window from scratches, and prevents squeaks. 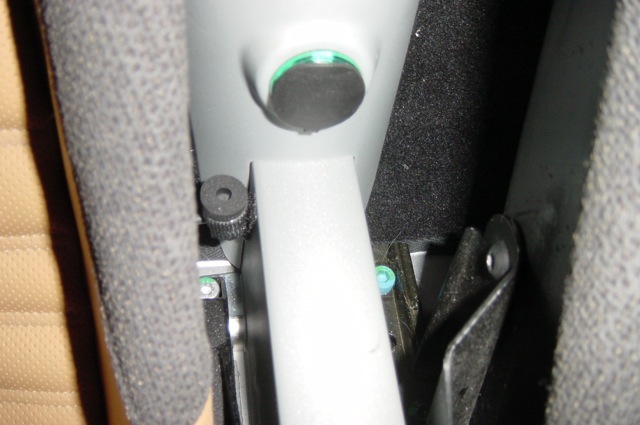 Remove the two screws in the plastic rear bulkhead panel, on either side of the interior light. Remove the interior light per the owner's manual. Center the RS plate over the interior light hole, and push it down firmly between the glass and the plastic bulkhead cover. Mark and drill the mounting hole in the top of the bulkhead. Put a dab of white-out on the short end of a small allen wrench. Use this to reach in and mark the center of the bottom hole of the L-bracket. Drill the hole and reinstall the plate, using a large washer between the bulkhead and the L-bracket. 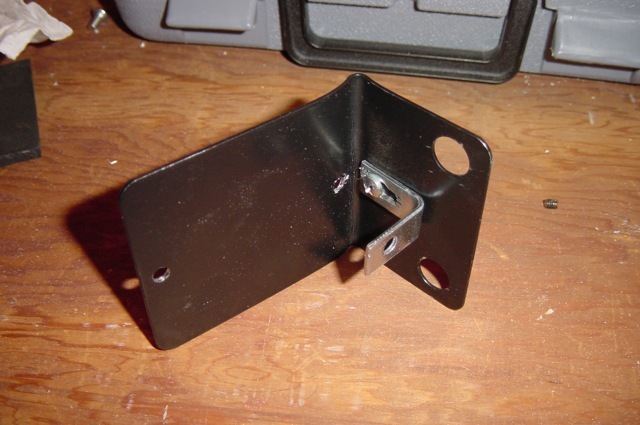 Pass a hex bolt down through the top of the bracket, into the bulkhead. Fasten it with a small washer and locking nut on the underside, using the interior light's hole for access with the wrench. Using the access hole in the top of the assembly, loosen the camera cradle's adjustment screw until the band-clamp unit comes off. Pass the bullet camera's cord through the clamp, and screw it back on to the cradle. Next, tilt the interior light into the up (always off) position, and snap it back into the bulkhead. 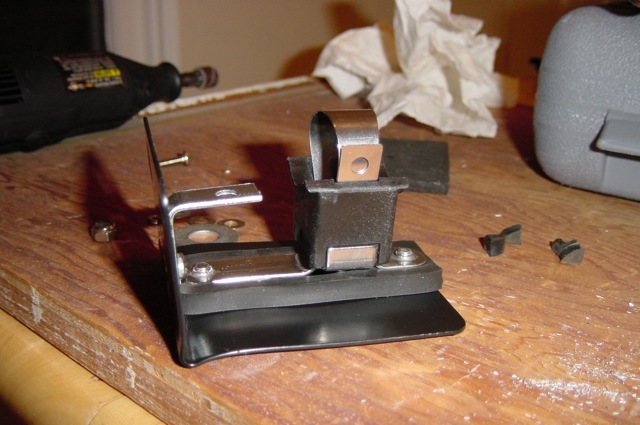 Replace the two screws in the bulkhead and tighten the band clamp. Note that this photo should show the Sony Camera, rather than the ChaseCam. Now that the main camera is mounted, we need to wire it up. Remove the passenger side cubby panel as follows. Remove the two screws underneath (driver's side shown). Slide the panel firmly straight down, then swing the top out. 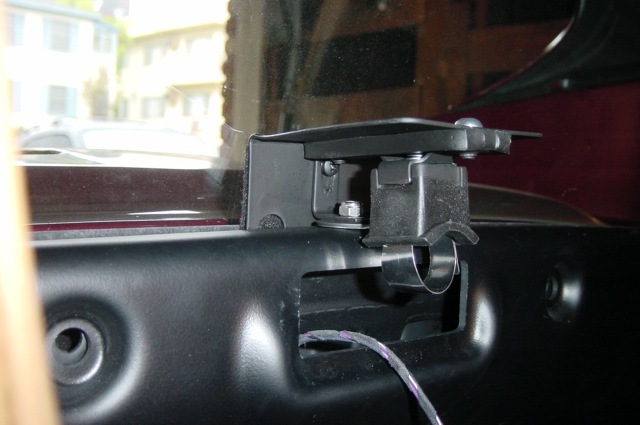 Tuck the wiring for the main camera behind the plastic bulkhead panel, run it along the bottom of the glass, then down behind the seatbelt to the passenger door sill. 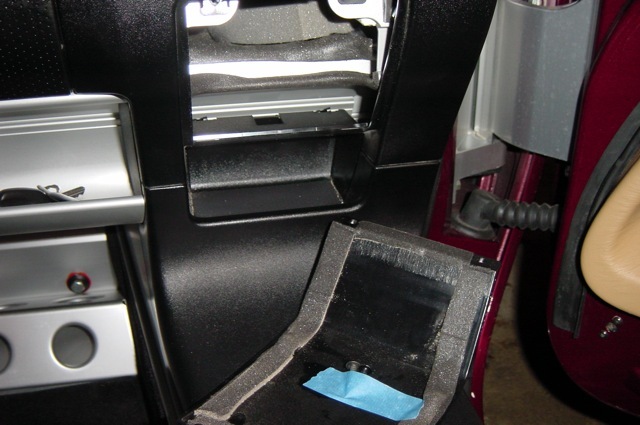 Tuck it up under the plastic door sill cover, and run it along the door sill to the passenger footwell area. Feed it up behind the passenger side cubby, and tuck it away. 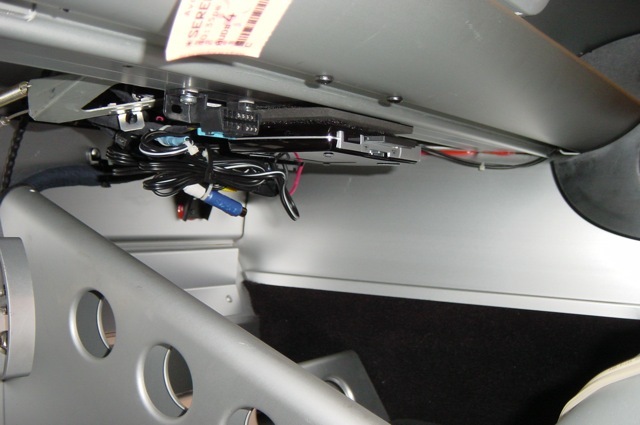 From there, feed it down under the dash, to the under-dash area in front of the center console (near the OBDII connector). Leave it hanging down from under the dash for now. Next, we need to run a ground wire for all our video equipment. Grounds are always tricky on this car, since neither the frame nor the body can be used. One convenient place to take ground for this project is pin 4 on the OBDII connector under the dash. Another option (which I opted for) is to run a ground wire from the back of the radio, over to the passenger cubby, then back down under the dash. The side cubbies are an easy way to get from inside the dash to under it. 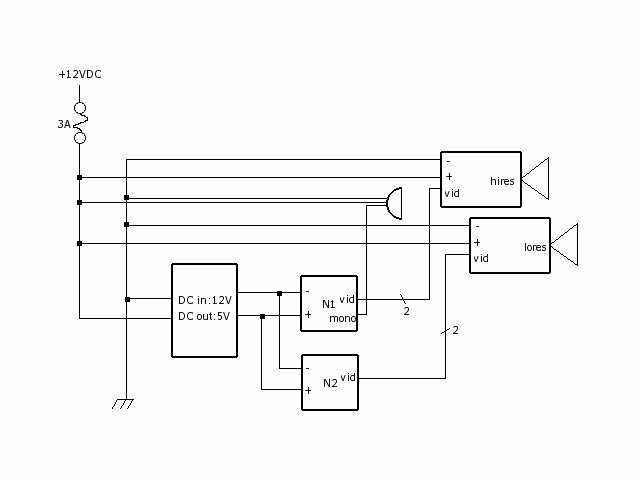 Now that we have a ground, we'll need a switched +12VDC source. 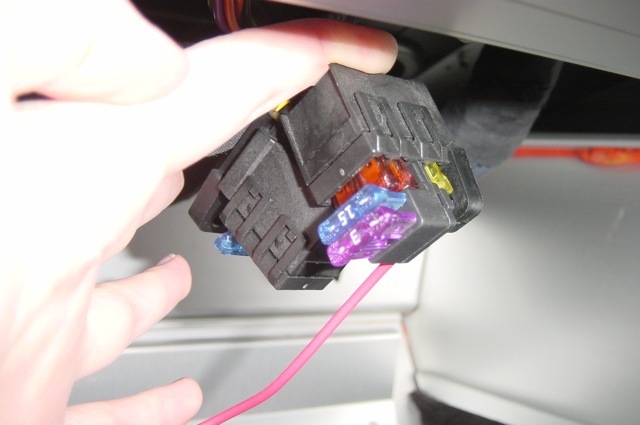 Since we're installing everything under the dash, the accessory fuse block is a handy place, using a fuse tap. I opted to use the 15A wiper motor circuit. It's a good idea to tap into the largest circuit you can, to minimize the impact of the additional current. There's also a 20A fan motor circuit there, but I was concerned that the fan motor circuit would be noisy and fluctuate in voltage. I'll likely never be filming while the windshield wiper is running, so this seemed the best bet. The cameras draw negligible current, and the Neuros recorders draw about an amp each, so a 3A fuse should do the trick. Next we're going to build a harness to power everything. Start with the switching power supply, and cut off the lighter plug. Wire together the DC connector from the ChaseCam hardwire kit, the 12VDC input of the power supply, and a 16 gauge wire for power and ground. I made these connections with a string of western unions, soldered together tightly. 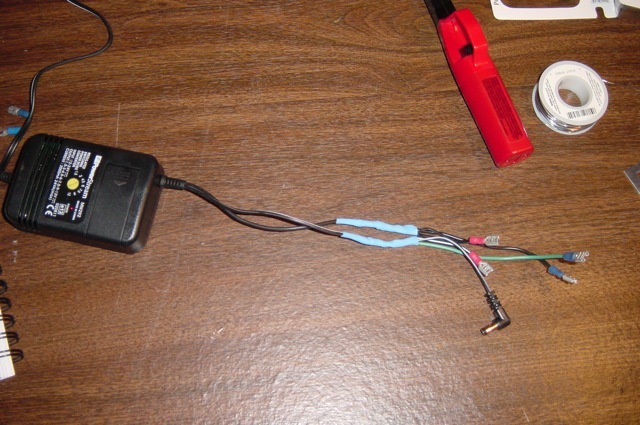 Cover the connections with heatshrink tubing. The black and green wire (with blue spade connectors) are the inputs to the harness. 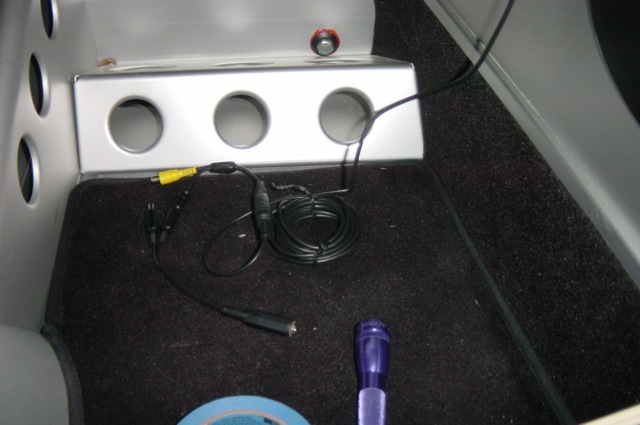 12V goes in there, and is sent out to the two cameras (one of which includes the microphone), and the power supply. The other end of the power supply goes to the recorders (the power supply is conditioning the source and converting from 12V to 5V). I also added two red spade connectors for future expansion (taped off for now). Connect the fuse tap and your ground to the harness. 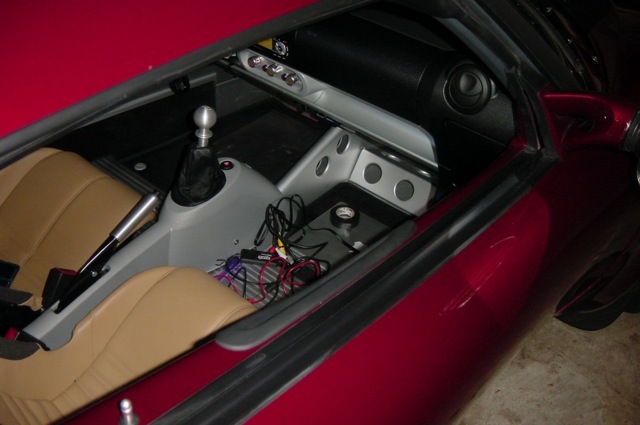 Secure the harness and power supply up under the dash. Now that the wiring is in place, test and align the main camera. 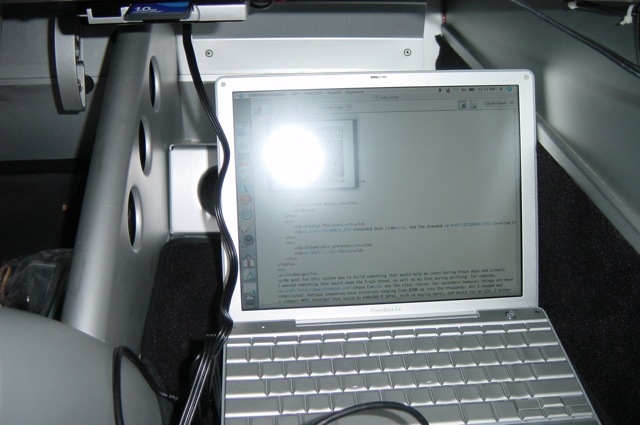 Connect the video output of the camera to a portable video display device such as a laptop. Now we're going to mount the recorders. 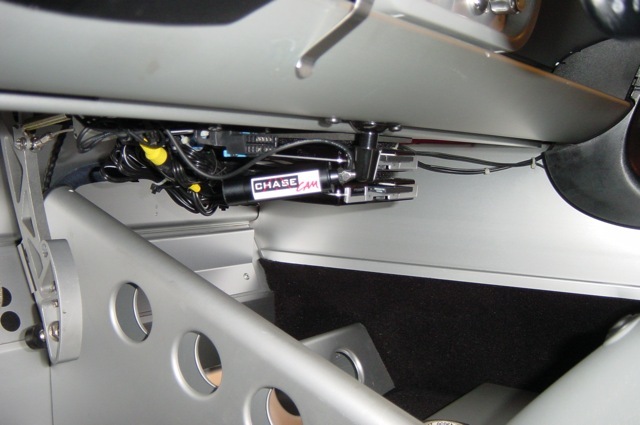 The Neuros units are designed to be used in a cozy living room, not a British race car, so we need to protect them. Build a sandwich of heavy-duty velcro and craft foam. This will allow the recorders to be easily removed, while isolating them from some of the shock and vibration of the track. Secure them to the flat spot under the dash, next to the OBDII connector. 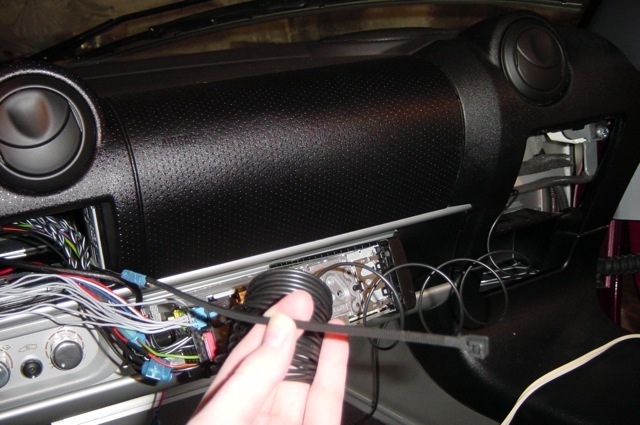 With the recorders mounted as indicated, they are easily accessible for changing the memory cards, but are virtually invisible due to the sight lines from outside the car. Hopefully this will discourage thieves. Here's the view from outside. The recorders are now mounted, but they need juice. 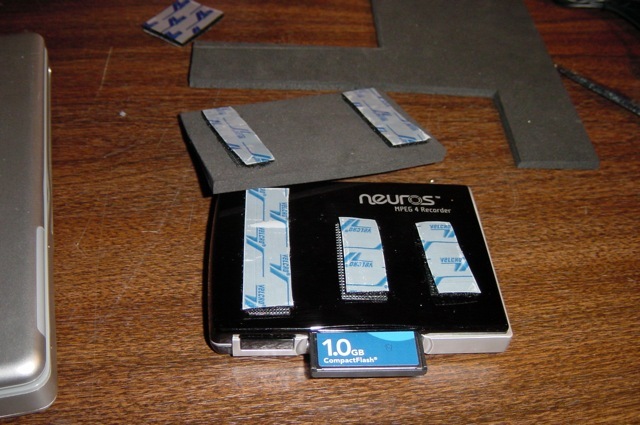 Conveniently, the tips on the ChaseCam DC-Y adapter are the same size as the DC connectors on the Neuros units. Less conveniently, however, they are the wrong length. The Neuros DC tips have a longer barrel, and a ring at the end. The ChaseCam ones will not lock in properly when seated in the DC-in ports on the recorders. I cut the ends off the AC adapters that come with the Neuros units, and soldered them on to the ends of the ChaseCam Y-adapter. I opted to mount the microphone between the seats. This should be protected from wind, while allowing it to pick up both engine noise and the occupants' panicked screams and profanities. 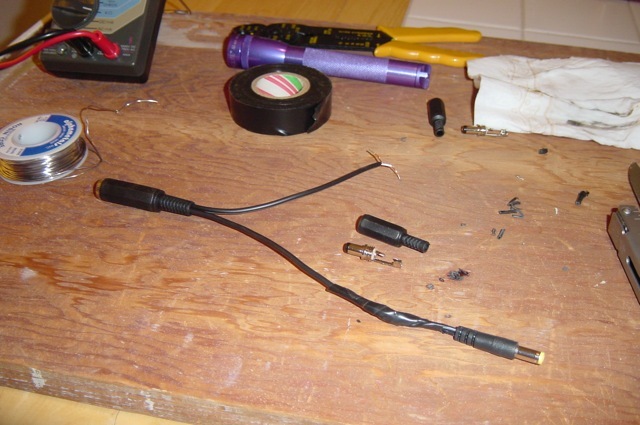 Connect the power and audio connection for the microphone, and feed the wire using the same route you did for the the main camera. Mount the microphone with velcro. 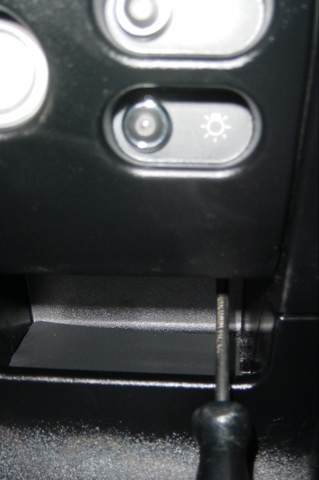 It's shown here under the lighter socket, but I've since moved it to the side of the "cup holder". I found that it picked up too much noise from the shift linkages in the pictured location. Mounting the pedal-cam is easy. Mount the camera to the round adjustable base that it comes with. Loosen the right-hand screw for the HVAC controls under the dash, and slide the base under that screw. The notch in the base that is intended for cord control is a perfect fit for the HVAC screw. Tighten it down firmly. Connect the power to the remaining DC socket, and connect the video output to your portable display. Align the camera for a good view of the pedals. Tighten down the adjustment screw on the base, and connect one camera to each recorder. Note that the recorders are shown stacked, but I later changed them to a side-by-side configuration. It was more stable and took less space. That’s all there is to it! This was a fun project to put together, and it has given me years of trouble-free performance. It’s been a useful tool for improving my skills at track days and in preparation for races. Once I’ve recorded a session, I pop the Compact Flash cards into my laptop, combine the two videos into a Picture-In-Picture using Quicktime Pro, then edit them with titles, etc using iMovie. For lots of samples from this setup, head on over to my YouTube channel. I just wanted to recommend RaceRender.com for putting together race videos. The software is free (with a cheap “Pro” version) and will let you do quiet a bit with your racing videos (including multiple cameras POV, adding telemetry data and syncing videos). Nice system you put together, w/ great pics, looking to do a similar setup, thx for posting, its very helpful!